Technology has reshaped the definition of services across all industries. What used to be a simple transaction earlier has now moved towards being a more proactive experience. Indian consumers are longing for more, and service providers are exploring avenues to engage their customers better. Today’s consumers buy experiences and expect it to be the best too. Utility providers are in a struggle, having to conduct transparent operations, comply with stringent regulations, and undergo rigorous scrutiny from customers and the community. Pricing and services are paramount to sustained, positive customer relationships also, weather and climate issues are unpredictable and can cause outages or service reliability issues. Global energy demand is set to surge till 2040 by as much as 37%, according to studies by the International Energy Agency. As Utilities strive to meet inflating demands to deliver more affordable, safe, sustainable and reliable services, they will need to optimize their operations & business practices. However, in an existing environment of increased need and pressure towards energy conservation, attaining this mission seems like a mammoth task. In addition to this, the already ageing infrastructure of Utilities is prone to unpredictable failures and inadequate critical maintenance makes one wonder how Utilities will work towards achieving this massive target in the years to come. Leveraging new technologies and keeping a customer-centric mindset will help Utilities adapt and thrive way ahead. Delivering a rewarding customer experience is as important as delivering core services for leading utility companies. Business solution implementations help utility transition from a “customer service” mindset to that of “customer experience” by providing innovation in mobility, smart metering, analytics, etc. Legacy systems in utilities are incapable of handling frequent changes in tariff thus leading to revenue losses. Business solutions from SAP, Oracle, Microsoft, etc., have strong billing modules that support detailed tariff customization for customers. With shorter turnaround time, they ensure that utilities react quickly to market fluctuations and adjust their tariff accordingly. Some specific advantages of SAP Utilities in this area include customer eengagement, contextual marketing, customer service excellence, etc. Also, they are scalable and customizable to overcome the challenges of all kind of utilities; both big and small. They improve the billing cycle time, reduce exceptions and improve accuracy. WSS (Wave Self Services) that can be published on a public domain is a special feature that can provide customers with self-service intelligence capabilities to view and manage their utility usage, consumption pattern, usage history, billing, payment, and abnormal usage. Identifying potential problems can help avoid unplanned service interruptions in advance. Also, any delay in responding to any failure and maintenance issues can lead to operational inefficiency which can be regulated by real-time insights into asset health, peak periods, supply and demand analysis, and abnormal conditions. Data analytics-driven business intelligence solutions providing analysis via rich visuals and statistics are what utilities need to adopt. The capabilities of BI systems can help enhance the reliability, capacity, and availability of the assets, which in turn improves asset performance. This can ensure smoother operations at peak periods, eliminating downtime occurrence. Workflow improvements gained by integrating business intelligence solutions with existing automation processes can avoid asset failures, resulting in asset longevity and higher uptime. It also allows triggering maintenance schedule operations at regular intervals to receive notifications on asset health. Business intelligence acts as a modeling platform to determine patterns, spot trends and understand predictable behavior to improve overall efficiency. Real-time and accurate utility demand forecasting is crucial to managing supply and demand operations in a timely fashion successfully, and this would help them to identify key performance indicators and patterns for dependable forecasting of asset failures and performance. Actionable insights, prescriptions, and foresight are necessary for better decision making towards preventive maintenance, quality of service and outage management. SAP Utilities helps in Energy Supply Optimization, Capital Portfolio and Project Management, Fuel Management Scheduling and Load Management and has many more such exclusive features. Renewable energy sources and mandates are affecting utilities, and they are now required to include greener sources as part of their overall energy portfolios. Rising energy prices and climate change have elevated the need for energy management, and in many cases, customers are required to send and sell power back to the grid. Renewable sources make up for a small amount of the global energy market, but their adoption makes pricing power increasingly complex. Utilities might have to look at developing more flexible pricing models, take on the management of surplus energy storage, and to balance the need to maintain and repair the existing infrastructure while investing in and building greener options. 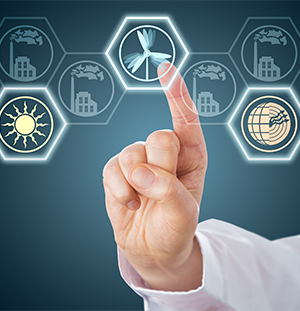 Technology advances are driving innovation in energy management offerings and can help conceptualize and deliver successful energy management services. Effective Customer Relationship Management (CRM) operations are critical for a utility company’s customer acquisition and retention goals. Utility companies must not only identify the best CRM technologies but must also influence effective change management strategies bringing people and processes in line with their customer relationship management goals. Capabilities of business intelligence solutions now automate and help optimize asset performance, reduce risk and operational costs, and enhance business responsiveness ensuring improved customer relationships as well as a higher ROI. SAP Utilities is a process-oriented sales and information system that supports all services provided by utilities and waste disposal companies. It has some exclusive features that can manage and bill residential, commercial and industrial, and prospective customers. As enormous volumes of data streams driven from smart meters, grids and sensors become readily available; utilities can perform real-time and predictive analytics to gain critical insights. Business solutions like SAP Utilities can help operators continuously monitor the vital signs of utility distribution systems, reliably and quickly assess system integrity, and gain hidden insights. This, in turn, helps in fault detection, and to determine anomalies on supply-distribution lines, thereby optimizing utility distribution and in the course minimizing utility loss and providing early detection of supply, theft, leaks, consumption and over usage. This increases operational efficiency for plants and grids, Asset network, operations, and maintenance. Consumer expectations continue to evolve swiftly as available technology drives new trends and makes information more accessible. Ideas that were once considered cutting edge are becoming commonplace and require Utilities to respond more quickly. Utilities need solutions with a strong history and a bright future, one that prepares for all the challenges and opportunities that lie ahead. The benefits of business solution implementations for Utilities are numerous, tangible and evident, which allows them to make faster and smarter decisions, empowering utilities and transforming the way they function. Utilities can optimize asset performance, create visibility and improve operational efficiency that supports changing business processes using business intelligence. Contact us today to get the conversation started, to schedule a demo, or to learn more about our strength in helping utilities adapt to business automation solutions.